David Mainse (right) welcomes guest Andrae Crouch (left) to the Assemblies of God television program, Turning Point, in 1977. Andrae and his twin sister, Sandra, spent their childhood singing in their father’s church and in community choirs, including one led by gospel musician, James Cleveland. When they were 14 years old, Andrae and Sandra were invited to Cleveland’s home for a barbeque. Andrae recalled looking up to Cleveland and thinking, I wish I could write a song. Watching the adults pour the large vat of barbeque sauce over the ribs, it reminded Andrae of the blood of Jesus and he begin to sing, “The blood that Jesus shed for me way back on Calvary, the blood that gives me strength from day to day, it will never lose its power.” Sandra wrote the words down but Andrae wasn’t happy with it and threw it in the trash. Sandra said, “Andrae, that was a good song!” She dug it out of the trash can, and kept it. In 1965, Crouch was attending the annual COGIC conference when the speaker asked, “Is there anyone here that wants to be used of God?” Crouch responded to the altar call and after the service several young men came up to him and said, “Hey, we’ve heard you play at your dad’s church. Would you come over and play for us at Teen Challenge?” Upon learning that Teen Challenge was a rehabilitation center for drug addicts, Crouch tried to put them off by saying, “Maybe I’ll come over sometime.” They responded with, “Come by tonight.” Andrae went with them but had no desire to work with them. Yet on the way home he kept hearing an addict’s choir singing in his head. After a long prayer session, Crouch felt God telling him to sell the car he loved, quit his job, and go to Teen Challenge to start a traveling choir of former drug addicts. Alongside his work with the choir at Teen Challenge and at his father’s church, Crouch starting singing locally with a group of friends who called themselves “The Disciples.” In 1969, Ralph Carmichael, a Pentecostal record producer, heard them and invited them to a session to record an album, Take the Message Everywhere. Thirteen years after Sandra pulled Andrae’s first attempt at songwriting out of the trash can, listeners heard on the airwaves the song, The Blood Will Never Lose Its Power. Crouch soon left Teen Challenge and began traveling full time in music ministry, including an early engagement with a traveling evangelist who took him on a world tour just a few short years after his first album, giving a wide audience to the musician and songwriter whose popularity was burgeoning. By 1973, Crouch had recorded a live album at Carnegie Hall and in 1975 appeared with Billy Graham at a televised crusade in New Mexico. The impact of Andrae Crouch’s influence on contemporary Christian music in the 1970s and forward is impossible to quantify. For the first time, mainstream Christian radio stations were playing music performed by a black man for white audiences on a large scale. Crouch’s concerts drew both black and white audiences at a time when most concerts were segregated whether by intention or not. Today Crouch’s songs, such as Bless the Lord, O My Soul; My Tribute (To God Be the Glory); and Through It All can be found in most contemporary hymnals. Few musicians can say they had both the respect of evangelist Billy Graham and the respect of pop-icon Michael Jackson, whose public memorial service included Crouch’s choir singing his song, Soon and Very Soon. When he died in 2015, he had won eight Grammy awards and had an Oscar nomination for his music on the movie, The Color Purple. Despite the fame and fortune, Andrae Crouch remained in the COGIC ministry and, along with his sister, Sandra, served as co-pastor of the church his father founded in Los Angeles. Broadly speaking, Andrae Crouch was one of the most widely influential Pentecostal ministers of the 20th century. Read more about David Mainse’s interview with Andrae Crouch for Turning Point TV program on page 20 of the May 22, 1977, issue of the Pentecostal Evangel. The orchestra at Bethany Temple in Everett, Washington, circa 1928-1932, featured musicians such as Myrtle Peterson Robeck on piano (left) and Levi Larson on trombone (right). What role should music play in the church worship service? A 1929 Pentecostal Evangel article affirmed the value of music, while warning against the tendency to make the worship service into a form of entertainment. Chambers was not opposed to the contemporary worship music of his day. He affirmed the joyful singing accompanied by numerous musical instruments for which early Pentecostals were known. He was concerned that, in some quarters, a certain professionalism was creeping into the church, which emphasized performance over the presence and power of God. He cautioned that musical performances sometimes overshadowed the other elements of the worship service. Chambers encouraged readers to read 1 Chronicles 13-15, which documented how Israel learned the importance of worshiping according to God’s plan. The church, he believed, could benefit from the lessons provided by Israel’s example. While there are many ways to organize a worship service, Chambers’ article reminds Pentecostals to rely on the Holy Spirit and to keep the necessary elements in balance. Click here to view this issue now. Revivaltime choir, circa 1960s. Cyril McLellan, director, is standing in front, far right. When people reflect on Revivaltime, the long-standing weekly radio broadcast of the Assemblies of God, they often think of the much-acclaimed speakers, C. M. Ward and Dan Betzer. But the ministry of the Revivaltime choir, made up of students from Central Bible College (CBC) who volunteered to sing on the program each week, was just as important. The Assemblies of God released the first Revivaltime broadcast on Easter Sunday, 1950. Three years later, on Dec. 20, 1953, the program was broadcast from the Bowie Hall auditorium at CBC and began airing on the ABC Radio Network with C. M. Ward as the speaker. Through the years, it is estimated that more than 1,300 people ministered as choir members and musicians under the leadership of Cyril McLellan, Revivaltime’s longtime music director. Although McLellan trained for and expected musical excellence, the emphasis of every practice and broadcast was prayer and a desire for the anointing of the Holy Spirit. Each year, two or three times as many talented CBC students auditioned for the choir than could be used. Those selected willingly gave up many hours each week to prepare for the half-hour broadcast. The students only met a small fraction of their audience, and they seldom would see the results of their ministry in music and prayer. Yet there are many testimonies of persons who have been saved, healed, encouraged, and helped by their singing. An article in the Pentecostal Evangel from 55 years ago entitled “Why They Sing for Revivaltime” gave some background on why the students gladly sang for Revivaltime. The article includes testimonies from choir members as well as people in the audience. Why did they sing for Revivaltime? One factor listed, in addition to their love for singing, is that the students found that “working with the talented choir director, Cyril McLellan, is a rewarding experience.” They also caught on to the vision of the ministry they could have through Revivaltime. “There’s no other ministry where so many people in so many places can be reached at one time,” said Carl Guiney, another sophomore. Revivaltime was not just a radio broadcast, it was a ministry that touched lives through the message and songs. The choir prayed often. Their focus was not on performance, but on ministering the gospel through song. Read, “Why They Sing for Revivaltime,” on pages 16-17 of the April 15, 1962, issue of the Pentecostal Evangel. Pentecostal Evangel archive editions courtesy of Flower Pentecostal Heritage Center. The Melodies of Praise hymnal and orchestrations made their debut in 1957. Pictured here are Assemblies of God Music Division staff members Lorena Quigley (left), Marie Salisbury (center), and Edwin Anderson. Early Pentecostals commonly believed that two books were essential for revival: the Bible and the songbook. Fervent, spiritual singing has been a distinguishing characteristic of the Pentecostal movement from its inception, alongside powerful anointed preaching. When Chairman J. W. Welch asked how many ministers would use a uniquely Pentecostal song collection. nearly all the ministers raised their hands. This recommendation was met with the 1924 release of Songs of Pentecostal Fellowship, the first Assemblies of God effort to produce a songbook that was distinctly Pentecostal. Songs of Pentecostal Fellowship was followed by other songbooks, such as Spiritual Songs (1930), Songs of Praise (1935), and Assembly Songs (1948). These collections consisted mainly of gospel songs which were popular at camp meetings and revival services. They also featured songs by Assemblies of God authors and began to bring unity to the congregational singing of the churches. The 1950s brought a “golden era” to Pentecostal music. Quartet conventions began featuring more Pentecostal groups such as the Blackwood Brothers, and the Assemblies of God established the Music Division of Gospel Publishing House. One of the Music Division’s first duties was to produce a songbook for congregational singing that would also encourage the use of orchestrations for instruments. This new songbook, Melodies of Praise, made its debut 60 years ago in the Pentecostal Evangel, and it was formally introduced at the General Council later that year. It was the first Assemblies of God music publication to be released in both round note and shaped note editions, giving it a broader appeal for use in the southern singing schools. Melodies of Praise kept the gospel songs that were popular in churches but also incorporated more traditional hymns, such as Great Is Thy Faithfulness. Conversely, the compilers also sought to expose more church members to newer writers, such as Ira Stanphill, with the inclusion of songs like Mansion Over the Hilltop and Suppertime. It also incorporated a newer genre of church music with its introduction of choruses like Everybody Ought to Know, I Shall Not Be Moved, and Isn’t He Wonderful. Another change the Music Division made was to release a companion edition with instrumental orchestrations. Most Pentecostals embraced the use of instruments in worship and, for the first time, church instrumentalists could participate in the accompaniment of song services with the aid of properly composed notation. Melodies of Praise was well received and sold 77,410 copies in its first year. By 1986, almost 2 million copies had been sold. Even after it was replaced in 1969 by the popular Hymns of Glorious Praise, it continued to sell well. Pentecostals have long known the power and importance of good church singing. The songs of the church teach and affirm biblical truth, are a spiritual expression of our affection toward God, and a testimony of His work in our lives. They also serve as a unifying factor. With the publication of a denominational hymnal, an Assemblies of God church member from Kentucky could visit a church in California and instantly feel at home during the congregational singing. As the 60th anniversary of the release of Melodies of Praise is celebrated, it is a time to recognize the Assemblies of God’s rich history of worshiping through song. Even as times have changed, and many churches have moved to electronic projection of songs rather than printed hymnals, the Assemblies of God is still known as a people who embrace the musical language of worship with fervent passion. New copies of Melodies of Praise are available through My Healthy Church. See the original advertisement for Melodies of Praise on page 10 of the Feb. 10, 1957, issue of the Pentecostal Evangel. 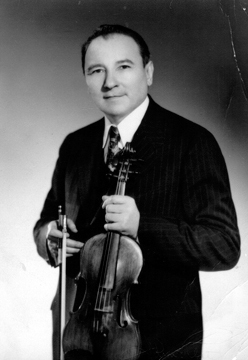 As a young man, Joseph P. Wannenmacher (1895-1989) was a rising star in the Milwaukee musical scene. But a miraculous healing in a small storefront mission in 1917 forever changed his life, and he went on to become a well-loved Assemblies of God pioneer pastor. He shared his powerful testimony in the October 29, 1949, issue of the Pentecostal Evangel. Like many other Milwaukee residents, Wannenmacher was an immigrant. He was born in Buzias, Hungary, to a family that was ethnically German and Hungarian. The Wannenmachers moved to Milwaukee in 1903, but his father was unable to adapt to American ways so they returned to Hungary after 10 months. In 1909, they returned to Milwaukee to stay. From an early age, music helped define Joseph Wannenmacher’s life. In Hungary, he was surrounded by some of the nation’s best musicians and became a noted violinist. In Milwaukee, at age 18 he organized and conducted the Hungarian Royal Gypsy Orchestra (named after a similar group in his homeland), which performed at many of the region’s top entertainment venues. Wannenmacher seemed to have it all. He could afford fashionable clothing, a gold watch, and diamond-studded jewelry. But underneath his successful veneer, Wannenmacher was haunted by his own human frailties. Wannenmacher knew that he was dying a slow, painful death. His flesh would swell, develop blisters, and rot. Doctors diagnosed his condition as bone consumption. His sister had already died of the same malady. Anger boiled up in Wannenmacher as he grappled with the unfairness of life. He developed a sharp temper and, try as he might, he could not find peace. Wannenmacher was raised in a devout Catholic home, so he turned to his faith to help him deal with his physical pain and bitterness. He frequently attended church and offered penance, but these practices did not seem to help. He then turned to Luther’s German translation of the Bible, which someone had given to him, and began reading it voraciously. In its pages he discovered things he had never heard before. He read about Christ’s second coming, salvation by faith, and Christ’s power to heal. Perhaps most importantly, he learned that God is love. Up until that point, he had conceived of God as “Someone away up there with a long beard and a big club just waiting to beat me up.” But then, at age 18, he began to discover the gospel for himself. The small band of believers had been fasting and praying that God would send someone who was in need of salvation and healing. The service was unlike anything Wannenmacher had ever seen before. He watched the people get on their knees and cry out to God. Their outpouring of genuine faith moved Joseph’s heart. The pastor, Hugo Ulrich, preached that sinners could be saved simply by trusting in Christ. It seemed too good to be true, Wannenmacher thought. Faith then came into his heart, and he started laughing for joy. The pastor thought Wannenmacher was mocking him, but Wannenmacher didn’t care. At the end of the service, Wannenmacher came forward to the altar and experienced a powerful encounter with God. In 1921 he married Helen Innes and started Full Gospel Church in Milwaukee. He went on to found six additional daughter churches in the area. He also served as the first superintendent of the Hungarian Branch of the Assemblies of God, which was organized in 1944 for Hungarian immigrants to America. After pastoring Full Gospel Church (renamed Calvary Assembly of God in 1944) for 39 years, he retired in 1960. While Joseph Wannenmacher went to be with the Lord in 1989, his legacy lives on in the churches he founded and in the people whose lives he touched. Calvary AG is continuing to reach people in the Milwaukee area and was renamed Honey Creek Church in 2015. Joseph and Helen’s three children, John, Philip, and Lois (Graber), were involved in Assemblies of God ministries. Philip served as pastor of Central Assembly of God (Springfield, Missouri) from 1970 to 1995. Philip’s daughter, Beth Carroll, serves as director of Human Resources at the Assemblies of God National Leadership and Resource Center. 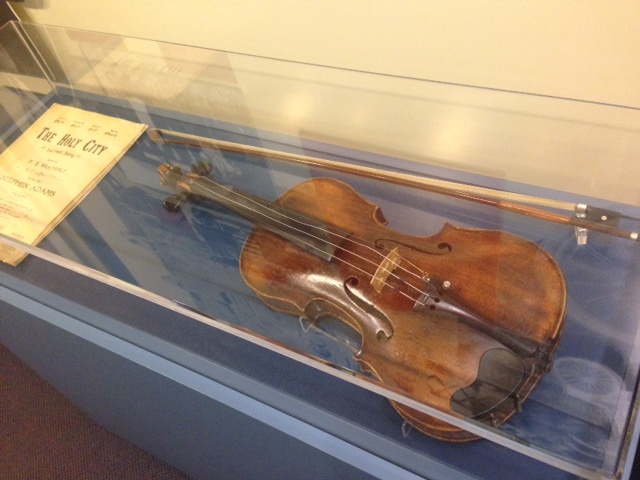 On the floor just above Beth’s office, Joseph’s “healing violin” is on display in the Flower Pentecostal Heritage Center museum. Joseph Wannenmacher’s story reminds believers that history never really disappears. People, events, and themes from the past tend to resurface in the present, but it often takes discernment to see them. God radically transformed Joseph Wannenmacher’s heart and healed his body, and the world has never been the same. Read Joseph P. Wannenmacher’s article, “When God’s Love Came In,” on pages 2-3 and 11-13 of the October 29, 1949, issue of the Pentecostal Evangel. 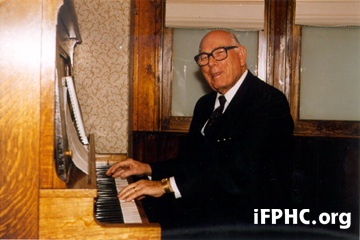 Hilton Griswold playing the piano in the E. N. Bell Chapel at the dedication of the Flower Pentecostal Heritage Center. The Flower Pentecostal Heritage Center is saddened to announce the passing of a dear friend and saint of God. Rev. R. Hilton Griswold was born on November 12, 1921, and he passed away on May 5, 2015 in Springfield, Missouri, at the age of 93. Hilton Griswold passionately loved Gospel music. He is remembered for playing the piano and singing baritone for the Blackwood Brothers Quartet from 1940-1950. He was credentialed as an Assemblies of God minister on July 10, 1948, and pastored churches in Missouri, Iowa, and Illinois. Hilton has been a friend of the Heritage Center for many years. In addition to singing and playing in the Assemblies of God National Leadership and Resource Center chapel on various occasions, he played gospel hymns and choruses for the opening of the Flower Pentecostal Heritage Center and museum on January 19, 1999. In recent years he ministered in nursing homes and senior adult gatherings. He also hosted his own program called “Inspiration Time,” which was released on television, radio and internet releases nationwide. He not only personally knew many of the gospel singing groups and composers, but he often knew the stories behind the songs, which he often shared on his weekly television programs. Hilton Griswold was preceded in death by his wife, Marie, and his daughter, Barbara Chapman. He is survived by his son, Rev. Larry Griswold of Plainfield, Illinois and several grandchildren and great-grandchildren. He leaves a wonderful legacy of gospel music and singing which will continue to inspire future generations.